A commenter mentioned this a few days ago and I checked it out: Pete's Apizza made Washingtonian's Top 100 restaurants, coming in at #83. Pretty cool to see, even if I do think their order and paying system is kind of awkward. I'm a big fan of the white clam, the chef's special, and the cheese slices, and the review noted the other fare too, which I've never had. No other Columbia Heights restaraunts made the list - sorry CommonWealth and The Heights. Unfortunately their website only has the top 20 on it, I guess so you'll buy the magazine. Police have charged a man with two fatal shootings in Columbia Heights and Adams Morgan. Obviously the shootings are terrible, but at least police got their man. The sadder news is the fact that passersby ignored a man on the sidewalk who had been beaten. The article says there were no visible injuries, so maybe people just thought he was drunk or high, but you'd think somebody would at least dial 911. I've called 911 for people who seemed to have passed out drunk before. If you see someone injured, do the humane thing and call the police. This is not the kind of thing I like to write about in the neighborhood. Other things to watch out for is young vandals around 13th and Kenyon. A Columbia Heights Yahoo group member notes he saw three kids, maybe 8-12 years old, throwing snowballs and ice at houses, and he confronted them. Later the garoyles in his front lawn were stolen. Apparently the poster has seen them doing other mischief before. Keep your eyes open! 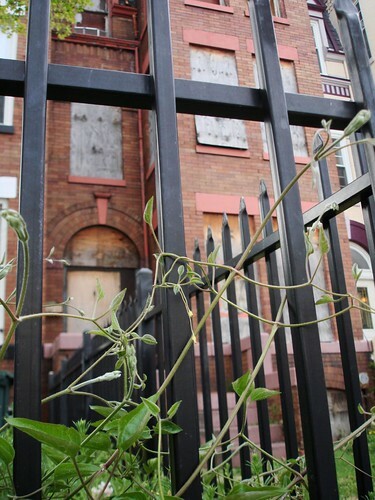 I've been meaning to post this for awhile -- there's a sign on 3004 13th Street NW, the abandoned house I've written about before, saying that's it's being auctioned by the city on the 30th. 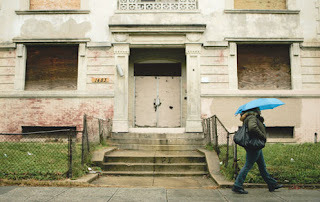 I'm very glad this is finally happening, as this place has lain vacant for far too long, and selling it could bring in new taxpayers and citizens make some money for the city. The auction will be at 441 4th St NW, aka One Judiciary Square, but I can't find what time. Other houses are being auctioned too - the Washington Business Journal has a brief article. A new curry joint is coming to 3118 Georgia Ave NW, just south of Kenyon. My friend walked by there yesterday and spoke with the proprietor, who said they'd be opening in a week. It used to be a place called Delta Food which sold fish, bbq, pupusas, chicken and such. I don't have the name yet or much other info, but pretty cool! Hope to have more info soon. Hate Starbucks? The employees at Sticky Fingers get on your nerves? Columbia Heights Coffee getting too crowded? Then I would recommend checking out Coco Libre on Sherman Avenue. This newly opened fair trade coffee house hits the spot. I'm not big on coffee so instead I tried one of their teas. I opted for the chamomile, and my girlfriend the Moroccan mint. Both were great, but they weren't the highlight: the young family that owned the place were. The lady who served us explained the nuances of our choices and had an interesting conversation about her advertising ideas for the place. They also have inexpensive sandwiches, about $2.99. 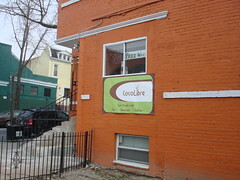 Coco Libre is at 786 Harvard Street NW, at Sherman Ave. Here's their Yelp page. Want some vegan pizza in the neighborhood? Then get yourself to Red Rocks. They just started selling vegan pizza with soy cheese and such. Here's more about it from the DC Vegan blog. A commenter here notes that Pete's Apizza also has vegan pizza, so you have two options in the neighborhood! Urban Art: Create art that speaks to how YOU feel about the world. Includes drawing, painting, and elements of 3-dimensional design. Graffiti: Put style and power in your words. Turn your doodles into art. Learn the art and business of graffiti. Stencil Art: Use this cool printmaking technique to turn your designs into posters, t-shirts, and more! Mural: You will design and create a mural using a mosaic technique in Columbia Heights. Portfolio Development: Want to go to art school? We mentor you to complete a visual arts portfolio. Create slides/CD of your work. Internet Journalism: You have something to say + We have a new way to say it. Audio, digital photography, video, blogging. Live Radio: Your voice. Your personality. Your ideas. Your music. Create your own Internet-based radio show. Photography: Learn to really control a camera to create cool photographs. You’ll master the darkroom and the digital domain. Music Studio: Whether you already rap or sing—or you’re interested in learning how—work with our MC's and singers to record your songs in our studio. It's a great way to begin your career as a music artist. Beat-Making: Learn to make the music you like—Hip Hop, Reggaeton, R&B, etc., it's your choice when using our professional digital music software and equipment. Experiment with turntables, live instruments, recording and more... And if you’re experienced in beats - advance your knowledge with AMH music producers. Percussion: Salsa, Go-Go, Merengue, Bachata, Rock … all have their roots in percussion. Learn to play afro-latin drums, Congas and Bongos. Youth registration fee is $15 – Registration covers any classes and supplies for youth age 11-18. Yesterday I heard some noise outside my house, and walked out to find a parade going south on 13th Street. There were about 30 paraders with drums and other instruments, and they said they were from the Rhyhtm Workers Union, a group which does activism and has drum circles. Some people from the Code Pink antiwar group had joined up. 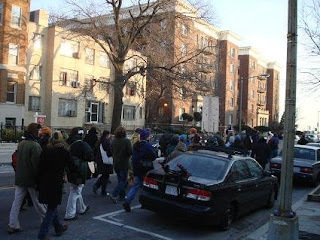 They stopped at 13th and Clifton for awhile and said were headed to the African American Civil War Memorial on U Street. Pretty cool to see. Did you notice anything in the neighborhood? Just heard this terrible news - Dunkin Donuts on 14th is out of both bagels and croissants. This is the second weekend I can remember where it happened. That stinks! I guess try Starbucks or Columbia Heights Coffee for your morning greasy sandwich needs. So let's say you're an out-of-towner who's here for the Inauguration, staying in the hood on somebody's couch or at a friend's place. What do you do? For eats, 14th Street and Park Road are your places to go - 14th and Irving alone has Pete's New Haven Style apizza, Panda Express, Potbelly, Five Guys (a great DC burger chain), CommonWealth, a gastro-pub, and more. Up 14th there's The Heights, good for brunch, and Nori, a sushi joint. On Park Road just east of 14th, try El Rinconcito II, a great Salvadorean place, or some tasty fast food at Pollo Campero, a Latin American fast food chain, or Julia's Empanadas. There's also a Giant grocery store on Park Road. On 11th at Lamont, Columbia Heights Coffee is great, and 11th and Park has Red Rocks Pizza. Just down 11th at Kenyon is Wonderland, the neighborhood watering hole. There's also a Starbucks on 14th between Kenyon and Irving. The Mount Pleasant neighborhood, a block or so west of 16th along Mt. Pleasant Street, has more, including pizza, American food, and lots of tasty Latin American. Which brings us to drinks. Wonderland is the focal point of the neighborhood, tons of people go there and they have DJs upstairs sometimes and pretty good bar food. The Heights and Red Rocks have booze too, but are more restaurants. CommonWealth is, as noted, a pub, and farther north at 14th and Spring is the Red Derby, a great bar with lots of beer, but only in cans - cheaper that way - you'll probably want to take a cab there and back. The neighborhood is also within easy stumbling or cabbing distance of the U Street bar and restaurant strip (along U Street from about 16th to 9th) and Adams Morgan, also a big bar and restaurant strip (Columbia Road and 18th Street is the epicenter). Mount Pleasant has a few spots too, including The Raven, a cool and cheap dive. As for transportation, say hello to your feet. They come in handy in DC, and might be useful if traffic really is as bad as people say. Also, cabs are relatively inexpensive. The Columbia Heights Metro is at 14th and Irving, and that can take you pretty much anywhere. There's also buses that go down 16th, 14th, 11th, and Georgia, which make easy trips downtown. And if you go farther west, you can catch buses like the 42, which goes from the corner of Columbia Road & 16th to Adams Morgan to Dupont Circle. When it comes to shopping, there isn't much in the neighborhood. There's a few small places on 14th, the Target and Best Buy, and Simply Soles shoe store. and Mt. Pleasant has a lot of quirky little places - dollar stores, etc. You will find crazy stuff there. As for actual shopping, U Street is a good spot, with lots of boutiques, vintage stores, and cool design and furniture stuff. Adams Morgan has a similar mix. As for sights, there's nice architecture along 16th Street, and Meridian Hill Park, between 15th and 16th south of Euclid, is very impressive during the day (can be a little sketchy at night). 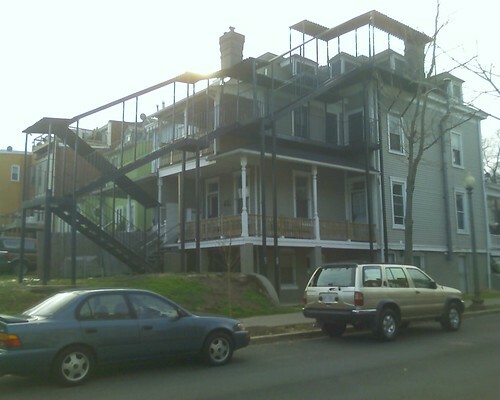 The view from 13th and Clifton south is impressive too, you can see the whole city from the crest of the hill. And the Nevin Kelly art gallery is having an open house on Saturday. So there you go! Any out-of-towners checking on things to do here have any questions? While it's not specifically Columbia Heights, I figured this would useful for neighborhood folks going down to check out the scene: it's a video on how to help report on the Inauguration using your photos, Twitter, or iPhone. You can send in your experiences and images and let people know what's going on in town this long weekend. Just got this from Jim Graham - Metro is staying open later after Inauguration, until 2 am Tuesday. Pretty solid, as I expect a lot of people will be partying after the ceremonies. Kenyon Street cleanup this Monday! As part of Barack Obama's Day of Service on Martin Luther King Day, there's a Kenyon Street clean-up from 10 am to noon on the 19th. The group will meet at 650 Kenyon Street NW and make their way west to 14th, and if there's a big crowd, expand to other streets too. So sign up, and dress warmly! The cleaner-uppers are meeting at Wonderland after they're done. And if you want to do more (or don't want to clean up streets but still want to help) there's a ton of other events too. Beware folks, it is freezing in the neighborhood! The wind chill is 5 right now. I was outside briefly and my hands were numb - better get gloves and a scarf, or buy one from CVS or Target! 2009 from 2:00 to 6:00 pm to celebrate our new space in Columbia Heights. Take a tour of the gallery, enjoy refreshments, and view new works by many of our gallery artists as well as some Polish favorites. I've been meaning to write more about Simply Soles, the shoe store that opened up at 1438 Park Road NW a few months ago - they sell designer women's shoes, including some the owner, Kassie Rempel, designed herself. Rempel also writes a blog about the store, and there are often sales and such going on. I'm interested to see how they do, as most of the retail in the neighborhood is of the chain and not boutique variety. Obviously I'm not too into women's shoes, but I appreciate when new, local non-chain businesses open - pay them a visit! Map of bars staying open late for Inauguration! Just found this (via DCist via Capital Spice): it's a Google Map of the places that will be staying open late for Inauguration Weekend - the ones with 4 am last calls that can serve food 24 hours a day. Of course, this just means they're able to, not that they will necessarily. It looks like only Rumberos (which I had a terrible experience at) will be open in the neighborhood, but that U Street is the place to go. The map might not be perfect, as I asked at the Big Hunt yesterday and the waitress said they would be open late, and there are also about 70 places whose applications to serve late are still pending - they have to get permission from their neighborhood's ANC, because they're under "voluntary agreements" where they aren't allowed to be open past a certain time. I think Wonderland might be under one of these - I'll do a post soon about which local spots will be open late. Mail thief on the loose? Looks like there may be a stolen mail problem in the neighborhood -- there's been some email traffic recently on the MPD 3D Substation listserve about it. One person living at 13th and Irving St. NW reported seeing a woman take her mail. The victim then followed the woman, who then rummaged through some mail at another house on the 1100 block of Harvard St. NW, then went into another house on 11th Street. The victim tried to take photos of the woman, but they didn't turn out, and police came but the caller couldn't identify the woman for sure. In response, a few other folks noted similar problems, on 11th and at 10th and Otis. Aside from calling the police (which you should do) there's also the US Postal Inspection Service, which treats stolen mail very seriously. Their phone number is 410-715-7700. They also have an online reporting page. Anybody else have this kind of problem? 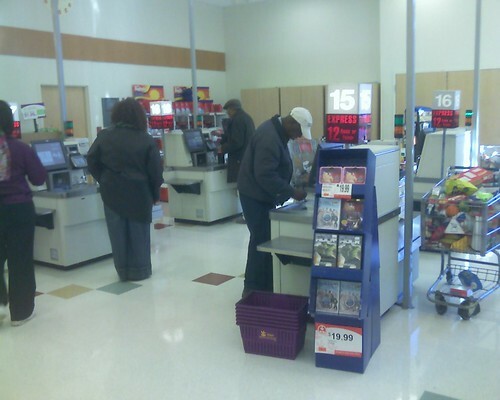 I hadn't been to Giant in awhile (I avoid it like the plague) but I was in on Saturday and noticed they have self checkout lanes now. Hopefully that will speed things the lines up a bit - anyone notice any improvement? Street closings due to a fire: 14th St. NW from Florida Ave. to V St, and the intersection of 15th St. NW and W St. NW. Please completely avoid this area if possible during PM rush hour. Still trying to rent for Inauguration? I wrote earlier in the month about renting your place out for Inauguration, and how I wasn't having much luck. I just did a longer piece for DCist with more about it. In short, it seems like a lot of hype and very little results. Most people who put their place on Craigslist didn't get a response, and those who got their places rented did so because they knew somebody or through a school listserve, and most were for much less than had been hyped - $300 a day instead of $1000 or $2000 a day. D'oh. So how about you? Renting your place? Any luck? I saw this at about 13th and Otis, pretty crazy. I guess there's a unit on the top floor, and the stairs are how they get there? Wild. 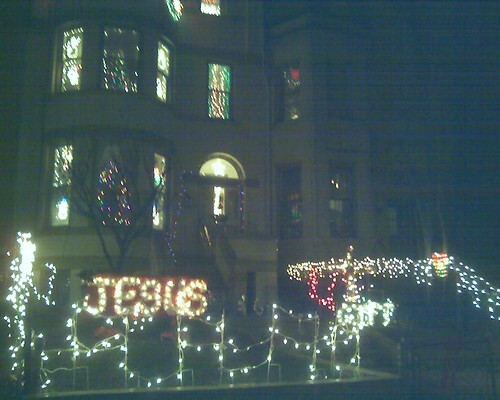 I saw these lights on Euclid between 13th and 14th, pretty big set-up. Anybody see any other big displays, or set up your own?